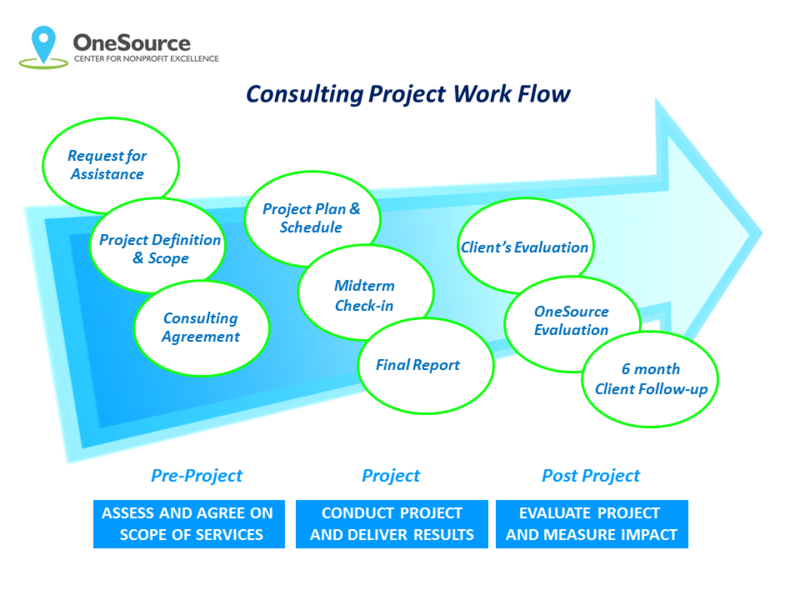 OneSource Center boasts a volunteer workforce of more than 100 individuals with executive leadership and management skills developed in both for-profit and nonprofit organizations. With an average of 25 years of professional experience, our volunteer consultants are well qualified to help find solutions to the unique challenges you face. Because our consultants come from a variety of backgrounds, our teams possess the range of expertise you need to work through operational issues, strategic challenges, or leadership development concerns. 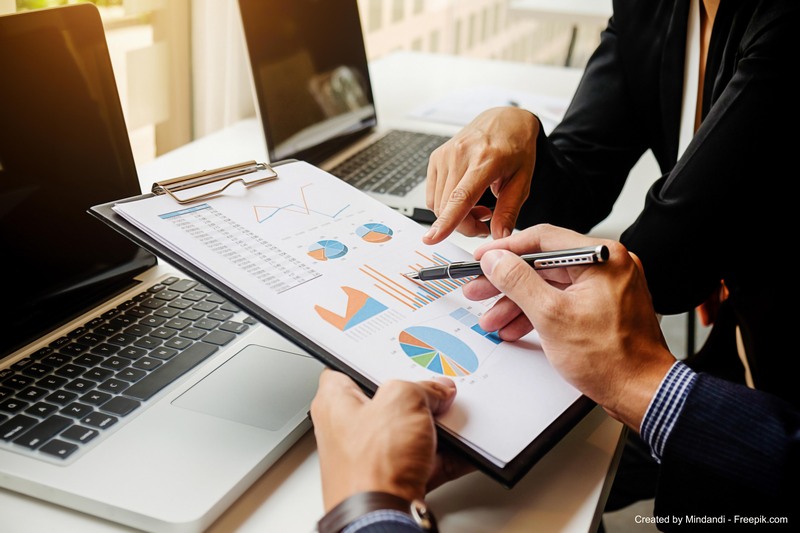 Working collaboratively with you, your project will yield a detailed plan with clear steps to implement your solutions, which followed will strengthen your organization. By no means is this an exhaustive list of the types of projects we do. Moreover, with a portfolio of nearly 1,000 projects completed since 1995, it’s likely we can provide assistance to your unique situation. 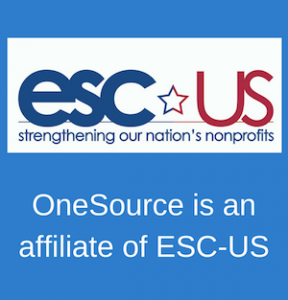 Additionally, OneSource Center is an affiliate of the Executive Service Corps-United States, a national network of organizations that provide consulting, coaching, facilitation and many other services to strengthen nonprofits, which means access to thousands of volunteer professionals with myriad talents. Please contact us soon to discuss your nonprofit needs. After receiving your Request for Assistance, we meet with you to understand your needs in depth and assess and prioritize the ways in which we can help. We will prepare a consulting agreement, concisely detailing the scope, duration and cost of the project. Then we assemble a team, led by a project manager, to work with you and your team. 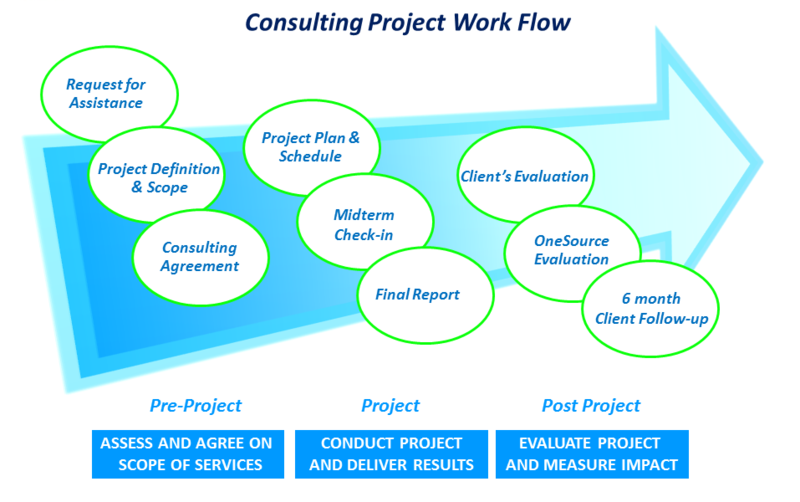 While the duration of all projects varies depending upon complexity, on average, most will be concluded in six months. We work hard to ensure that we have met or exceeded your expectations. Most importantly, your nonprofit will come away with the tools and strategies you need to achieve maximum community impact.